We’d love your help. Let us know what’s wrong with this preview of Cardcaptor Sakura, Book 4 by CLAMP. The conclusion of the Cardcaptor Sakura saga Now is the time for people to admit the feelings for other people they've held secret . . . but there are so many feelings, running in so many directions What are the true desires of Eriol, the powerful young boy who is the reincarnation of Clow Reed . . . and why did he wish that Sakura would replace him as Master of the Clow? 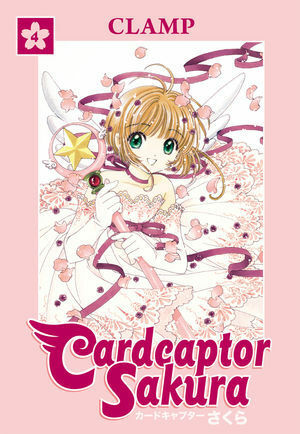 To ask other readers questions about Cardcaptor Sakura, Book 4, please sign up. A great finish to an amazing story. A little bittersweet, of course. What amazes me the most is that these series were published (the last book in 2000, so they started way before then), and the diversity in these books is ginormous. You think it - Sakura has it. It is the most inclusive and accepting cast of characters that I have ever had the pleasure of reading. And the best part? Everything has such a natural flow - there's no awkwardness, there's no labels, nobody is ever put in a box because of their preferences. These people love so purely and wholly that all they care about is that person's soul. Be that person a girl, a boy, an angel or whatever. Definitely a classic manga must read! A beautiful end to a beautiful series. World: The art is fantastic. The final couple of issues are just simply gorgeous. The world building is solid and only there enough for the emotional story. There are bits and pieces called back from the past which is good. Story: Well paced and full of character moments. Where thee first half of the series was about finding the cards the second half is about the characters and I love that. The final mystery and the confrontation was done well, a bit pacey A beautiful end to a beautiful series. Story: Well paced and full of character moments. Where thee first half of the series was about finding the cards the second half is about the characters and I love that. The final mystery and the confrontation was done well, a bit pacey and rushed in the end but still done very well. The end took it's time which I really enjoyed. A wonderful end. Characters: Sakura is strong with a distinct personal voice. Her journey from chapter one to now is a big arc and her story is wonderfully done and tied to personal growth, good stuff. The rest of the cast also get a lot of character moments this final quarter of the series. Where sometimes in the past these characters were just set dressing they really had growth in her end. Good job. I like this series a lot because it birthed a really wonderful anime and seeing the roots of that here is fantastic. Oh I'm so happy with how this concluded! Even if I am sad to see this series finishing (aside from the new part of it starting soon? ), I am glad it ended the way it did. I love (view spoiler)[Syaoran and Sakura together and Yukito and Toya(view spoiler)[ I'm a bit iffy with Rika being so young and having a relationship with a teacher. But other than that I loved the rest of this story! I loved the growing protection Yue felt for Sakura and that Toya still seemed to have a bit of his sixth sense Oh I'm so happy with how this concluded! Even if I am sad to see this series finishing (aside from the new part of it starting soon? ), I am glad it ended the way it did. I ADORED this!!! It was sooo cute seeing it all wrap up! A forever favourite definitely, both in manga and anime! The 4th volume of the CCS Omnibus edition contains issues 10, 11 and 12 and it’s just the most epic conclusion ever. I saw the anime, but there were some things that are different from it in the manga, so I adored to get re acquainted with the story and the characters in a new light. I loved the secret behind Sakura’s dad (DID NOT SEE THAT COMING) and how the battle with Eriol was developed. The 11 manga was brilliantly done; the story is so powerful and full of friendship. It has a beautiful of The 4th volume of the CCS Omnibus edition contains issues 10, 11 and 12 and it’s just the most epic conclusion ever. I saw the anime, but there were some things that are different from it in the manga, so I adored to get re acquainted with the story and the characters in a new light. I loved the secret behind Sakura’s dad (DID NOT SEE THAT COMING) and how the battle with Eriol was developed. The 11 manga was brilliantly done; the story is so powerful and full of friendship. It has a beautiful of message of loyalty and believing in yourself that’s just inspiring. And the 12 manga was THE MOST ROMANTIC ENDING IN THE HISTORY OF TIME. SHAORAN IS JUST TOO MUCH. I LOVE HIM TO THE MOON AND BACK <3 It was so sweet that my heart just couldn’t deal. I loved the ending and the new OVA that detailed the last manga to its very core. This is such a rich story, I can’t wait for the Clear Card anime & mangas to come out! 5 stars all the way! I loved it! The ending of this series was perfect. I wish there was more, but I came to the end. I know Tsubasa features Li and Sakura, but I am not a fan of it. And back to being rather boring. The big bad wasn't a big bad after all. Sakura saves the day, and half the volume is about her enduring love for Sayoran which isn't nearly as fleshed out as it is in the anime. Also, just not as adorable now that I'm older than 13. The designs and concepts of CSS are amazing, but the end product was actually pretty boring. And gross at times... I liked the adventure feel to the anime more than this weird rumination on love that went no where. The final omnibus had plenty of sweet moments and exciting scenes. Drama and love swirling around the pages in beautiful lines and patterns. There is so much to love about CLAMP's use of emotion. There story telling is so creative and heartfelt. But if there's one thing CLAMP seems incapable of, it's knowing when to stop. While this volume has some amazing moments, it was also plagued with typical CLAMP pitfalls. While the final confrontation with Clow was exciting and satisfying, the conclusion The final omnibus had plenty of sweet moments and exciting scenes. Drama and love swirling around the pages in beautiful lines and patterns. There is so much to love about CLAMP's use of emotion. There story telling is so creative and heartfelt. But if there's one thing CLAMP seems incapable of, it's knowing when to stop. While this volume has some amazing moments, it was also plagued with typical CLAMP pitfalls. While the final confrontation with Clow was exciting and satisfying, the conclusion is drawn out far too long as everyone makes their final confessions or takes their leave. While some of the romantic pairings are beyond adorable, CLAMP introduces another gross kid/adult romance. AND has Rika make another appearance just as she's about to go on a date with her teacher. CLAMP presents this as if it were romantic but I am so disturbed by it. Bunny Drop had the same problem. What is with these creators finding this a 'cute' idea? I'll never understand. Had it not been for those key concerns I would have given this final volume a five star rating. But the drawn out final two chapters and those two, totally ick romantic pairings really dragged down the experience for me. WHAT?! IT'S FINISHED?! Why?!?! There are no words to describe how much I loved this series. Like wow. It was so cute and I just ate up book after book. It's the type of series that at first you're not sure if they're gonna be good or not so you borrow them from a friend and after the first book you realize that you NEED to buy them. Like I can re-read this series over and over again and not get tired of the characters and the plot. Like I need to buy these now because it's just a series that id WHAT?! IT'S FINISHED?! Why?!?! There are no words to describe how much I loved this series. Like wow. It was so cute and I just ate up book after book. It's the type of series that at first you're not sure if they're gonna be good or not so you borrow them from a friend and after the first book you realize that you NEED to buy them. Like I can re-read this series over and over again and not get tired of the characters and the plot. Like I need to buy these now because it's just a series that id love to re-read over and over again. Sakura is a character that is so easy to love. Actually, all the characters are. I loved them so much and I loved being able to follow them on their adventures. When they were sad, I was sad, when they were happy, I was happy. Whatever the characters felt, I felt too. It was a good ending for a great manga. I can read that ending over and over again. Cardcaptor Sakura is the perfect example of a series that gets better and better as it goes on, and manages to end even more beautifully. I expected romance of a sort going into this series, but I didn't expect it to explore so many different kinds of love--the love one has for family, the love they have for friends, the way love that one has for different people can be so similar and yet so immensely different at the same time, the way loving someone sometimes means seeing them happy with someo Cardcaptor Sakura is the perfect example of a series that gets better and better as it goes on, and manages to end even more beautifully. I expected romance of a sort going into this series, but I didn't expect it to explore so many different kinds of love--the love one has for family, the love they have for friends, the way love that one has for different people can be so similar and yet so immensely different at the same time, the way loving someone sometimes means seeing them happy with someone else--so simply and stirringly. This final omnibus is full of all sorts of love, and all of it is so charmingly portrayed. Sakura's conversations with Yukito in this volume were so well done. Yukito and Yue were great characters, but the way Yukito treated and spoke to Sakura always felt warm and tender. Really wonderful character. Syaoran and Sakura's relationship was in part a vehicle for showing the characters' growth as they became more familiar with their heart and desires, but also served as a reminder to readers that you sometimes have to search within yourself for some time before realizing what and who you want. Relationships aside, Sakura's powers and role truly came full circle in the end, and I feel like everything was resolved or concluded neatly. The only thing I don't feel was truly ever explained is why Clow made the cards in the first place. Sakura could use them to defeat enemies, but the only enemies she ever HAD to defeat in the course of the story were the cards that she was capturing, and then those in her battles to change the cards. I plan to start both xxxHOLiC and Tsubasa next, since they're side-by-side reads, so maybe that (Clow's reason for making the cards) will come up. But as this was my first foray into this series, I have no idea if it will. Being the final volumes of the original Cardcaptor Sakura manga this omnibus book is a splendid addition to anyone's collection. With an assortment of color pictures and bright white pages in an over-sized print the cost of 20 dollars for 3 manga is a bargain. In this volume the truth is laid bare as Sakura realizes her true feelings for several characters in the story, Eriol's motivations come to life at last, and Sakura's final trial awaits her as she meets her destiny. If you have been followi Being the final volumes of the original Cardcaptor Sakura manga this omnibus book is a splendid addition to anyone's collection. With an assortment of color pictures and bright white pages in an over-sized print the cost of 20 dollars for 3 manga is a bargain. In this volume the truth is laid bare as Sakura realizes her true feelings for several characters in the story, Eriol's motivations come to life at last, and Sakura's final trial awaits her as she meets her destiny. If you have been following the Cardcaptor Sakura: Clear Card story you should defiantly read this volume to understand how incredible Sakura becomes by the end of the original series. When I was a kid, Cardcaptor Sakura was a household name. Anyone who has TV knows what it is. It is every little girl's aspiration, which was why I promised myself that when I get older, I'll watch it and understand the true essence of its story. Fortunately I was able to give myself the opportunity (not to watch but) to read the manga. The 50-chapter manga satisfied the childhood craving that has been inside me all these years. Finishing the story made me feel like my soul has been washed with When I was a kid, Cardcaptor Sakura was a household name. Anyone who has TV knows what it is. It is every little girl's aspiration, which was why I promised myself that when I get older, I'll watch it and understand the true essence of its story. Fortunately I was able to give myself the opportunity (not to watch but) to read the manga. The 50-chapter manga satisfied the childhood craving that has been inside me all these years. Finishing the story made me feel like my soul has been washed with relief and joyfulness because this is what I've been owing my past self, and I have paid my debt. God I am so happy that I finally know this story in its (original) completion. Cardcaptor Sakura was such a big part of my childhood and as an adult my love for this story has not lessened. I love all the characters and I loved seeing Sakura's journey unfold. I especially loved seeing an older Sakura at the end of the book it made me feel like a proud parent. I cannot wait to eventually continue this story with the Clear Card arc. I definitely recommend this series to everyone of all ages. It is God I am so happy that I finally know this story in its (original) completion. A great conclusion to a wonderful series! Five stars. This series is all about love, family, and friendship, and it really hit home in this last volume. I highly recommend this series. The art,story, and characters are wonderful and enchanting. I think I might like the anime slightly better, but the manga is just as good and not as censored. A must read for shoujo manga fans! This review has been hidden because it contains spoilers. To view it, click here. So I never read the manga for Cardcaptor Sakura before,only seen the anime(American version). I am so happy I read this! Although there was stuff that threw me off guard and I didn’t necessarily agree with. *spoiler alert* I honestly don’t see how it’s okay for a 10-11 year old to date a teacher. Besides that everything else it brought many found memories. im new here..do i have to buy the manga online or cannI readnit here? Perfect story, perfect ending, perfect characters!!! All the books were amazing but this one has a special place in me heart!! This last volume gets 5 stars for a perfect ending. This series made my heart soar.